Wendle W. Huddleston, president and chief executive officer of Hudson Shipbuilder, Inc. (HUDSHIP), recently announced that he and Larry D. Hornbeck, president of Hornbeck Offshore Services, Inc. of Galveston, Texas, have signed a contract for the construction of four large offshore tug/ supply vessels. 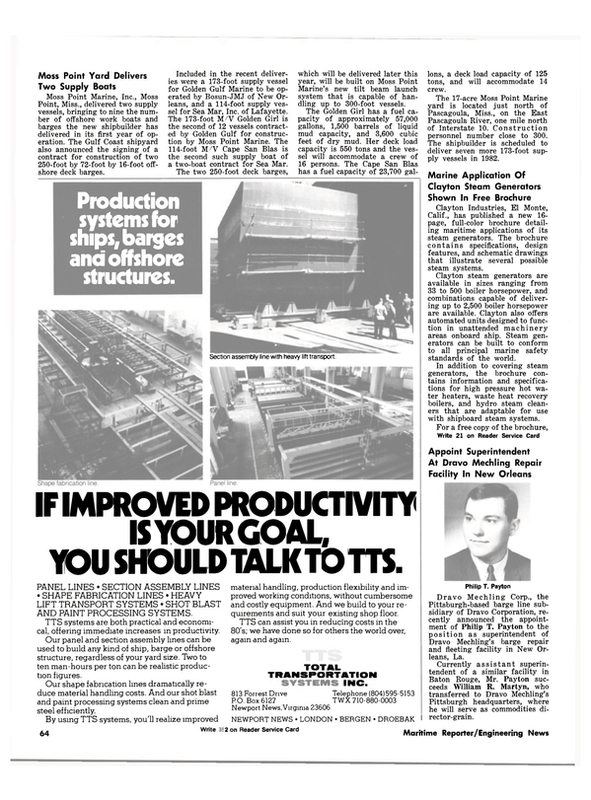 The Pascagoula, Miss., shipyard will deliver the first vessel during the second quarter of 1982, with the final delivery during the fourth quarter of 1982. The 185-foot vessels will be powered by twin Caterpillar D-399 turbocharged diesel engines, each with a maximum continuous rating of 1,125 bhp at 1,225 rpm driving through Caterpillar Model 7261 gears at 4.22:1 ratio. The vessels will be fitted with Schottel S152L, 300-hp bow thrusters driven by Caterpillar 3406 engines. With a beam measurement of 40 feet and at a depth of 14 feet, this allows the vessels to carry a minimum of 400 long tons of cargo. Each vessel will be equipped to carry both liquid and bulk mud as well as fuel and drill water for servicing offshore rigs. The vessels will be classified to ABS Maltese Cross A-1E and Maltese Cross AMS Full Ocean Service. Hornbeck Offshore is a service ship company based in Galveston, Texas, with operations in Corpus Christi. Their services are directed at the offshore rig supply and geophysical exploration markets. Hornbeck currently operates an existing fleet of nine vessels, with another six under construction. These four vessels will be built at HUDSHIP's new West Bank facility, which is located on a 161 L.-acre site on the Pascagoula River just north of the Ingalls yard.